All About Jazz is celebrating Joanna Pascale's birthday today! 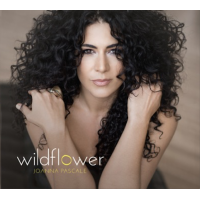 Since emerging onto Philadelphia\'s jazz scene, vocalist Joanna Pascale has established herself as a compelling and skilled vocalist. At just 24 years old Joanna already has a working repertoire of over 400 songs. She brings a strong emotional element as well as a solid sense of swing to her uncommonly large catalogue of jazz standards. Joanna has regular gigs as a leader at some of Philadelphia\'s premiere jazz venues... Read more.